Every month, I like to look at my web logs to see a report of recent search engine queries that brought folks to my site. I'm thinking about making a post at the end of every month that outlines some of the more fascinating search queries... and they really are interesting. While actual referrals are fun (it's nice to know who's talking about me), search engine queries give an entirely different picture of the kind of folks that end up here. 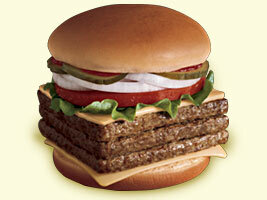 ... and the one that always amuses me is "Wendy's Classic Triple." Because really - who googles that up? If it's you, please comment and let me know why you're looking for this! I have that image on this post where I first decide that I want to become a vegetarian, back in May of 2005. ugh... look at it. It's taller than it is wide. 970 calories. Can you feel your arteries clogging? I searched "wendys classic triple price" and your site was the second link! Just getting some random cost/calorie data across a bunch of different foods. I think it is $4.79 at my local Wendy's, but I guess I will have to go get one for lunch to find out -> I normally get 2, meat and cheese only! I was actually searching for a decent image of a Wendy's Triple Cheeseburger and you are the only one who seems to have one! LOL!